For soups this weekend, we’ll have the Red Lentil Coconut Curry AND Spicy Ethiopian Vegetable with Sprouted Chickpeas; yum! We’ll bake off more Black Bean Burgers to be served with seasonal tomatillo salsa, then once we tire of those, we’ll move on to Sprouted Chickpea Burgers served with fresh local tomatoes and balsamic aioli. We have Thai Black Sticky Rice, which we may just have to make a regular part of our menu, it is sooo delicious! Sprouted Buckwheat and Millet Waffles with Banana Ice Cream and Berry Sauce are back! 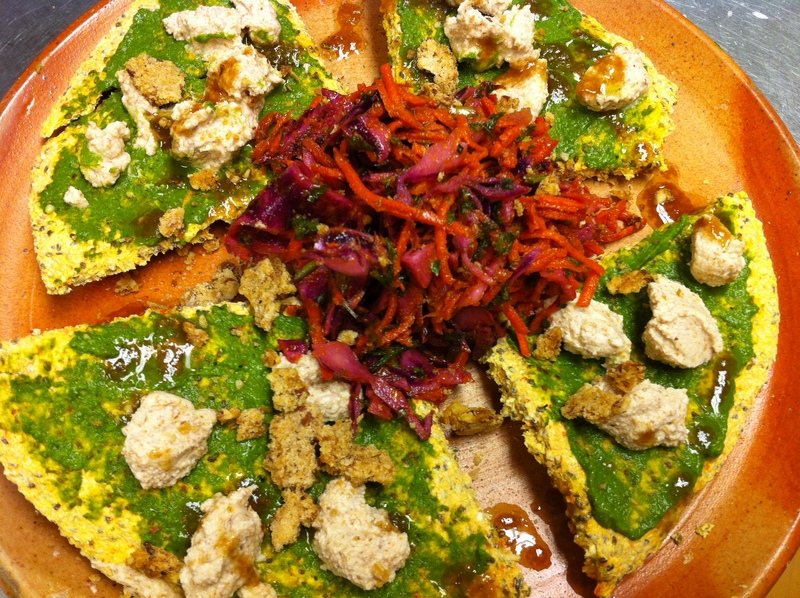 Of course, if you’ve been by the cafe lately, you know that the Lemon-Ginger Veggie Saute is now permanent fixture on our menu along with the Veggie Pancake Saute, Hummus Pizza, Raw Pizza (see photo above), Raw Cashew Cream Cheese and of course a whole array of gluten free and vegan baked and raw treats! Our grab and go fills up a bit more each day. Don’t forget, we’ll be open 8am-6pm on the weeknights starting next Monday, so swing by and grab some dinner to go!